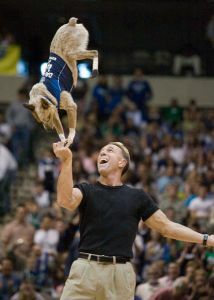 Leading the Way in Canine Entertainment! 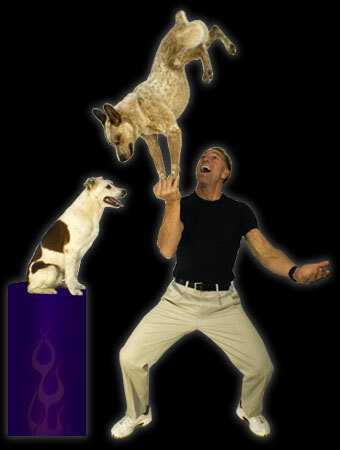 Trick dog entertainment for over 25 years! 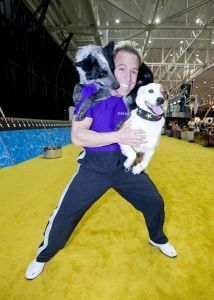 The Very Best in Canine Trick Dog Thrill Shows and dog entertainment, Lou Mack and CoolDog Productions presents – JUMP! The Ultimate Dog Show along with JUMP! The Ultimate Dog Challenge. 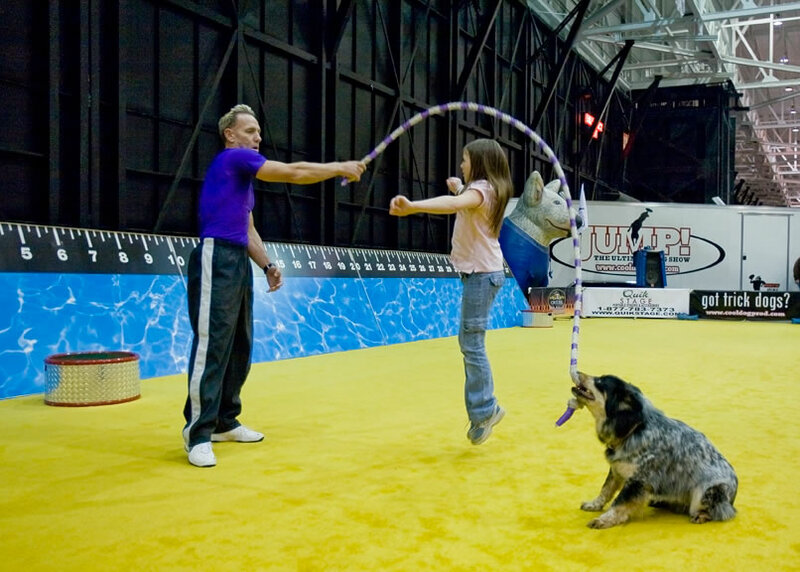 One of the most Exciting Canine Thrill Shows is a non Stop, Action packed Thrill Ride that showcases a variety of Breed and mixed breed dogs performing Incredible stunts, all choreographed to upbeat music. 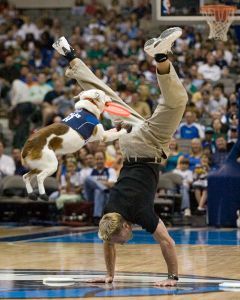 Billed as the X-Games for dogs, every show produces a One of a Kind staged Contest where the audience cheers for their respected team. 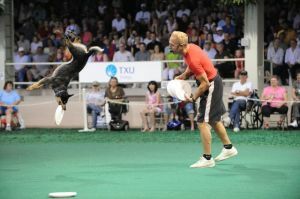 A variety of Unique Dog Sport Elements such as Dock Diving, Trick Frisbee, High Jump (Step Up), Weave Pole Racing, Jack Russell Hurdle Racing, all combined with plenty of Novel Pet Tricks!! 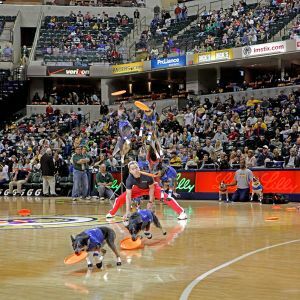 Halftime – Sporting Event Specialist!! JUMP! The Ultimate Dog Show has provided the very best in Canine Entertainment for all Pro and College Sporting Halftime, Pre Game Festival and Special Event venues for over 25 years. 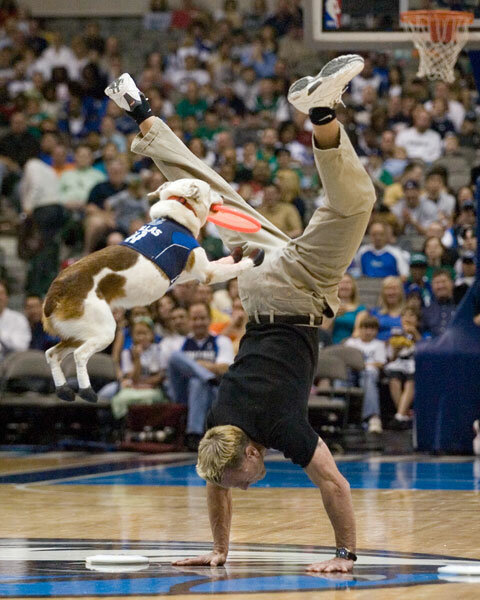 Rated as one of the top Acts in the Industry, Lou Mack and his Amazing pack of dogs keep your fans energized, entertained and on the edge of their seats ready for the second Half to cheer their team to victory !! Arena/Theater Productions – Cooldog Productions has provided many large scale Arena Style venues for 10-30,000 seating and more per show These 1-2 hour productions have received standing ovations from around the world for such clients as Purina South America, Iams / Eukanuba - Puerto Rico, Chile, Venezuela, Mexico, Spain, Europe, Asia, Canada, Hawaii and the Middle East. Stage sets, Props, lighting, large cast crews, from Development to PR to Technical and Logistical solutions, we cover it all world wide… Satisfaction Guaranteed!! 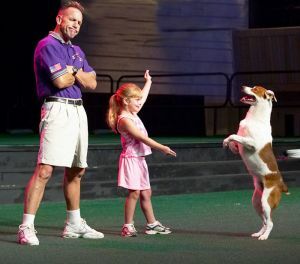 CoolDog Productions is a Las Vegas-based company that has provided the very best in Trick Dog Shows and Canine Entertainment since 1982. 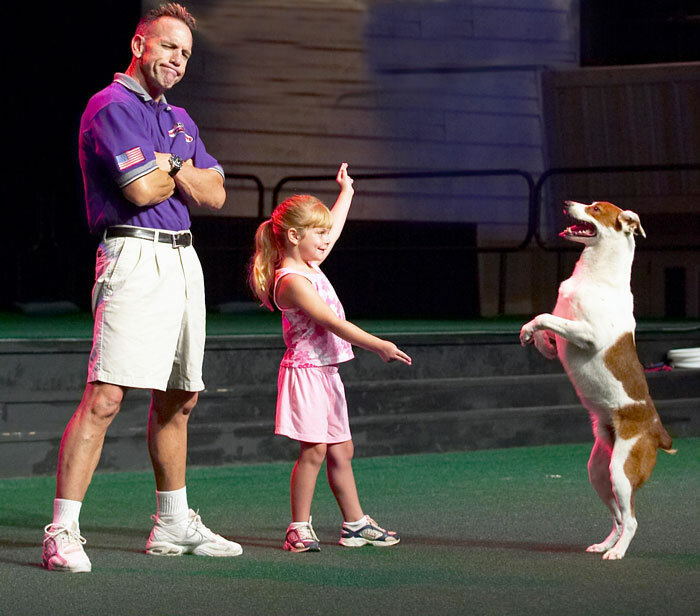 President/founder Lou “Mack” McCammon - AKA the "Dog Man" of Las Vegas combines energetic, innovative and cutting-edge presentations with the coolest collection of performance trick dogs in the entertainment industry. 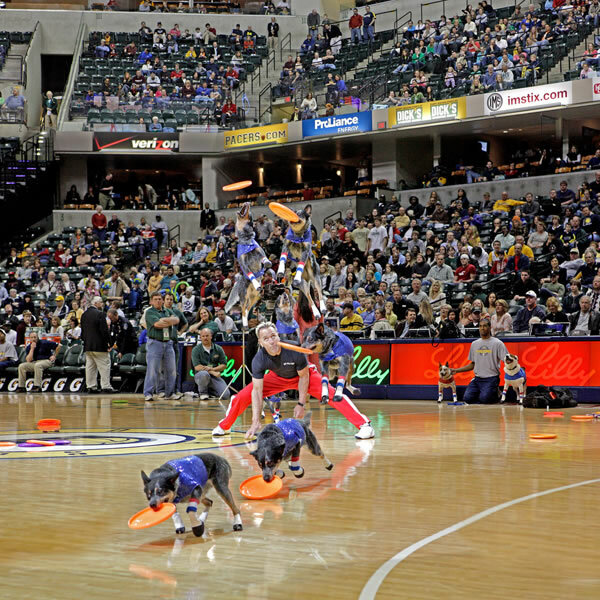 From high performance half-time shows and corporate convention booth appearances, to fair/theme/amusement park ground or stage acts and full-scale arena-style productions, our performances can be customized to suit any event or venue. Every CoolDog Production is guaranteed to entertain and engage your audience, from corporate executives to families. Our shows feature a combination of action-packed scripted performances; colorful props and costumes; and sharp, crystal clear sound. CoolDog Productions takes great pride in its extensive repeat and referral business, and we promise customer satisfaction at every show. 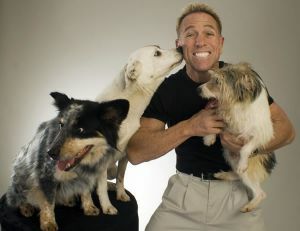 CoolDog Productions sets the standard in family fun Canine Entertainment. We travel throughout the world to perform at events, attractions and venues of all kinds for people of all ages and backgrounds. Our energetic performances range from six minutes to one and one-half hours in length and can be customized to suit any event or venue. Our customized performances feature many elements showcasing the finest in trick dog thrill show productions, including full-scale stage revues, completely self-contained ground acts, and popular half-time jams. Regardless of size or scope of the production, we guarantee customer satisfaction with our polished, precision choreographed routines; colorful costumes; appealing props; and clever scripts that revolve around all of our performing pet stars. We create memories that last a lifetime. Our canine stars live and train on a specially designed, state-of-the-art 2-acre professionally maintained training facility. 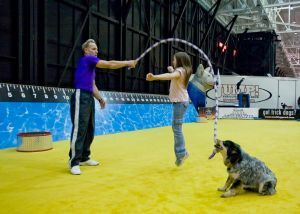 A separate 1,200-square-foot climate controlled indoor kennel (which is USDA approved) houses these pampered stunt dogs. Specializing in Film, Print, Movie, Special events. "A huge hit! 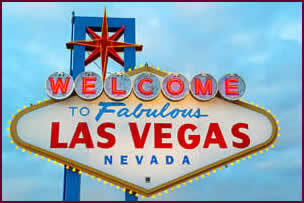 Viva Las Vegas"
"One of the most popular half-time shows we have had in years! " "Our crowds gave Lou and his amazing dogs a standing ovation. It’s was a first for us! "